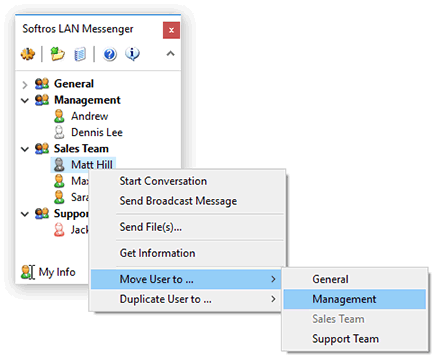 Adding groups in Softros LAN Messenger makes finding a user you need to contact much easier. 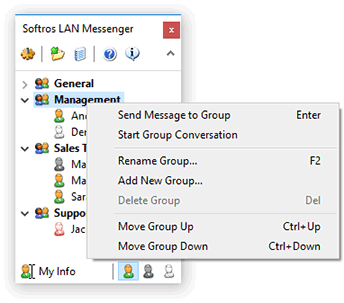 By default, when you first start Softros LAN Messenger, the only group showing up in the user list (and containing all users) is General. Any further ungrouped users are also put into it. Right-clicking any group in the list gives you access to a series of options. Add New Group Add New Group click it to add a group. In the dialog box which appears, enter a name for the new group, and then click OK.
Rename Group Rename Group click it to rename a group. In the dialog box which appears, enter a new name for the selected group, and then click OK.
Delete Group Delete Group click it to delete a group. In the dialog box which appears, click Yes. Please note that you can only delete groups that have no users in them. Move Group Up/Move Group Down Move Group Up/Move Group Down click either to movie a group up/down the list. Alternatively, you can click the group in the list, and then press CTRL+UP/CTRL+DOWN. There are two methods of moving a user to a different group. Click the name of the user you would like to move, drag it and drop it onto the destination group. Right-click name of the user you would like to move, hover your mouse over Move User to, and then click the name of the destination group.